Behind many of the decisions of Chinese acquirers overseas lie the idiosyncratic needs of some 415m millennials. So distinctive are the tastes of the generation born in the final two decades of the last century that China’s emerging multinationals are scouring the world to answer their desires. Not only is this individualistic, tech-savvy and internationally minded cohort reshaping the contours of China’s domestic consumer markets, it is also leaving an increasingly deep imprint on global M&A trends. The craving of millennials for quality — as well as for fun and healthy lifestyles — are evident in China’s largest outbound deals so far this year. The acquisitions by Haier and Midea, two Chinese household appliance firms, of the white goods divisions of GE and Toshiba respectively were driven by an imperative to upgrade their technology for an increasingly discerning domestic consumer. Wanda’s $3.5bn acquisition of Legendary Entertainment, a US movie company, was motivated largely by millennials’ love affair with cinema. ChemChina’s intention to purchase Syngenta, a Swiss seed and chemical firm, was prompted by an appetite for quality food. Even the approaches this month by a Chinese buyer to AC Milan, the Italian football club, are reinforced by the popularity among millennials for overseas sport, which they often livestream on to their mobile phones inside China. Such preferences are driving shifts in the pattern of outbound Chinese M&A activity, according to a new report by UBS. 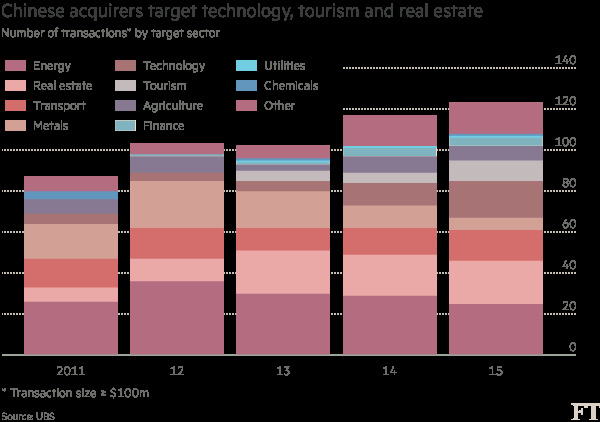 The number of outbound M&A deals completed in 2015 in the technology and tourism sectors — both of which are buoyed by millennial demand — rose 4.5 times since 2012 to a total of 18 last year. Tourism deals also jumped, from zero in 2012 to 10 last year (see chart), partly because millennials are becoming insatiable global travellers. Total spending by outbound Chinese travellers in 2025 is likely to reach $255.4bn, more than that by UK, German and French travellers put together in the same year, according to a study by Oxford Economics, a consultancy, and Visa, the payments company. Conversely, the number of deals in “old economy” sectors such as energy and metals — which are associated with the investment-driven model of growth that China is trying to transition away from — have dwindled significantly since 2012 both in absolute terms and as a share of transactions. Outbound acquisitions in the real estate sector rose strongly between 2012 and 2015, though this is not primarily a phenomenon driven by millennials’ demand. Overall, UBS expects the compound annual growth rate (CAGR) in Chinese outbound direct investment to hit 18 per cent over the 2015-18 period, up from a 14 per cent CAGR between 2008 and 2014. Total outbound direct investment was $118bn last year. As the M&A activity speeds up, so the pattern of purchases is set to shift. “We view the changes . . . as closely linked to the structural shifts now playing out in China’s economy,” according to the UBS report. “(These) include a rising share of the services sector in GDP, a greater share of consumer spending on discretionary areas such as travel, movies and online entertainment, internet and mobile shopping, etc, as well as slowing investment demand,” the report added. 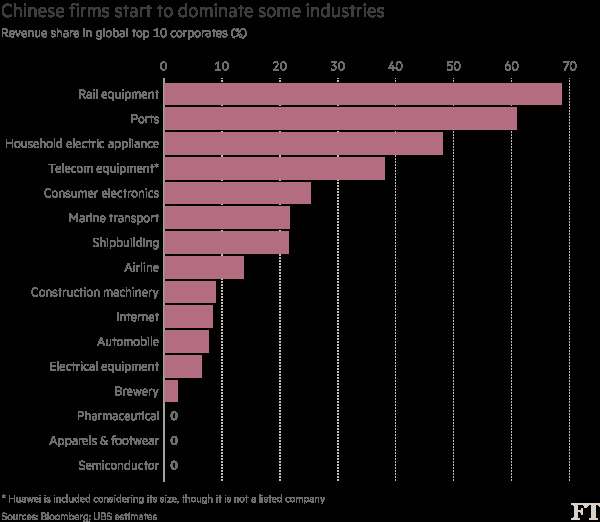 This is likely to accentuate the emerging dominance of Chinese companies in their sectors globally (see the second chart), with household appliances, consumer electronics and airlines particularly in the frame. UBS also sees considerable appetite among Chinese firms for overseas acquisitions in the semiconductor, automobile and internet industries. The two industries in which Chinese companies are overwhelmingly dominant from a global perspective — rail equipment and ports — have little to do with the influence of millennials. Forays abroad by port and rail equipment companies are supported by a vast domestic infrastructure market and generous financing from the China Development Bank and the Export-Import Bank of China.